This page is proposed by ICG Conseil. Some atmospheric gases, mainly carbon dioxide (CO2), but also methane (CH4), halocarbons (HFCs and PFCs), nitrous oxide (N2O) and sulphur hexafluoride (SF6), are called greenhouse gases (GHG): they act as a natural blanket retaining the earth's heat. Accounting systems: Regional registry systems (country level, Europe, worldwide) allow participants (industries) to track their greenhouse gases emissions units (GHGs) through carbon accounts. The measurement unit is the "ton carbon equivalent" volume of gas emitted (t CO2 eq). Regulation: greenhouse gases emissions quotas are defined for a given period by geographic area and by industry. Timeframe cap and reduction targets are set. Such constraints policies and market mechanisms are called the "cap and trade" system. derivative products to protect from future price's variation (hedging) or to benefit from arbitrage opportunities (trading). OTC (over the counter transactions). “Carbon finance” is the name given to the mechanisms and markets used to exchange and trade GHG (greenhouse gas) emission quotas. Mandatory trade and management of CO2 emissions systems go back to the 70's. The first implementation of a similar system was developed in the United States from the 90's. Its aim was to regulate emissions of a gas which causes acid rain, sulphur dioxide (SO2). Nowadays, the carbon economy and finance are in constant evolution, with differences depending on geographical zones . The carbon economy is considered as being one of the major challenges for the XXIst century's economy. There exist several carbon regulatory frameworks in the financial markets, based either on international treaties or on private law contracts. Each of them defines an emission allowance trade and exchange system: the organised carbon markets. There are also alternative mutual agreement transactions systems –organised outside carbon markets: OTC - Over The Counter. 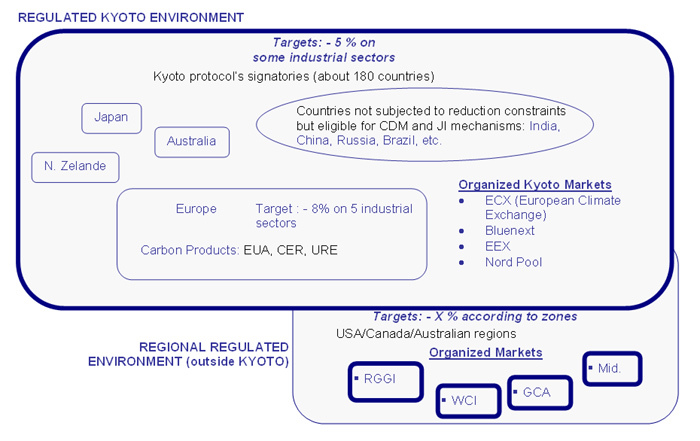 The Kyoto Protocol establishes an emissions trading system. It included a target to reduce greenhouse gases by an average of 5% over the period 2008-2012 compared to 1990 levels. These regulations are based on quotas and regional objectives. These regulated trade and exchange systems not committed to Kyoto nor to other regional agreements. Quotas and reduction targets are defined on a voluntary basis. The emergence and development of the new carbon markets is heavily dependent on the evolution of regulatory frameworks (some are still in their design/experimental phase). by industrial actor (ultimate emitter). They also record operations concerning allocation and exchange of carbon allowances: initial allocation, purchase, sale, obtaining of new rights, etc. Registry systems keep track of the emission allowance allocations defined by the Kyoto protocol regulatory framework. 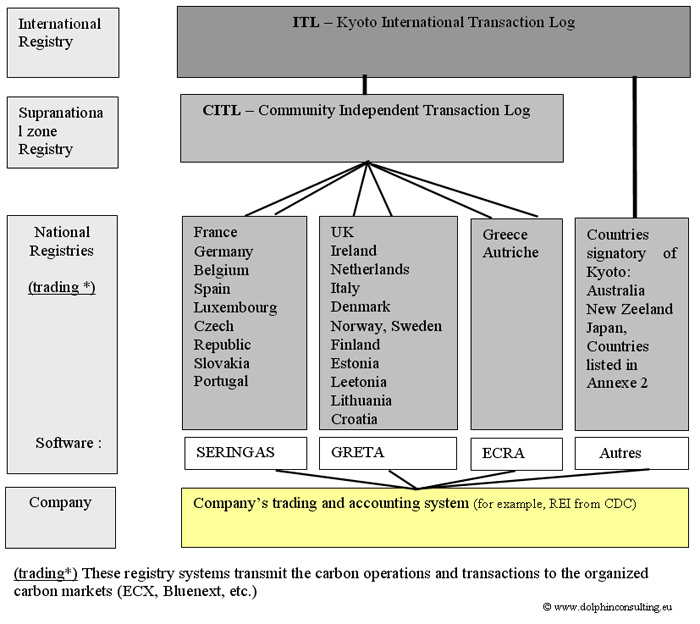 Emissions Trading : trading system allowing the sale/purchase of “unused” carbon allowance units. Quotas trading transactions: purchase, sale, etc. Allowance Amount Additionality criteria : the industrial project has to generate less CO2 than a classic industrial process, this CO2 differential determines the quantity of allocated credit carbon units. Organised carbon trading markets are enforced by both GHG international and regional regulatory frameworks. Improve society's marketing image through sustainable development (Corporate Social Responsibility). 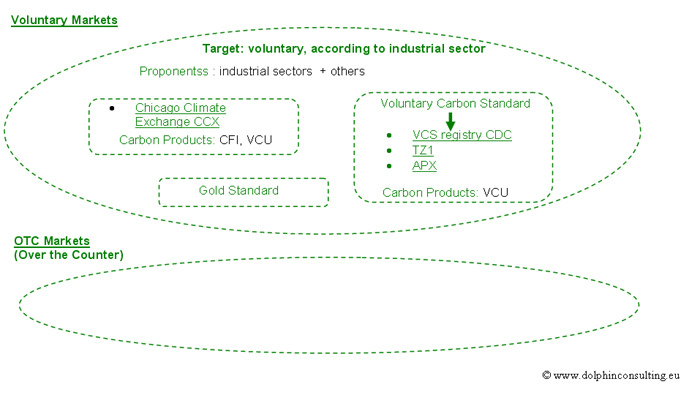 The leading Voluntary Carbon market is CCX-Chicago Climate Exchange. The CCX trades different carbon allowances issued from a large range of standardized projects: energy efficiency, the renewable energy, the capture of fleeting gases (methane), reforestation, among others. The Voluntary carbon markets are more developed in countries where there is no regulation or where it is under approval. The evolution is prominent across Atlantic (NYMEX-green Exchanges (NY) and CCFE-Chicago Climate Futures Exchange).